After a “warning” from the federal criminal police (Bundeskriminalamt), the bus charter company BVB canceled a contract of approx. EUR 6000 for coach buses for the “March for Freedom” from Brussels to Berlin. The buses had been paid in full on 6 June and were supposed to shuttle several hundred activists back to Berlin on Saturday, 28 June. Now the activists are stuck in Brussels. 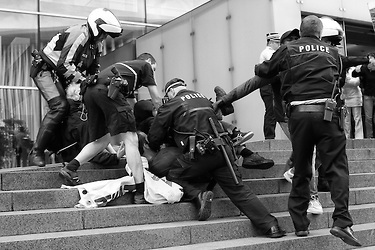 It is likely that the German police wants to prevent the Brussels activists from joining the protesters at the occupied school in Berlin, who are resisting an ongoing eviction by police armed with machine guns. More than 1000 people participated in the demonstration yesterday in Βrussels, led by refugees and sans papieres, in a great transnational composition and with powerful common slogans and songs..
Tuesday morning the police moved to evict a former school that is being squatted by refugees. The Gerhart-Hauptmann-Schule on Ohlauer Straße, in the neighbourhood of Kreuzberg, Berlin, has been squatted for the last year and a half. 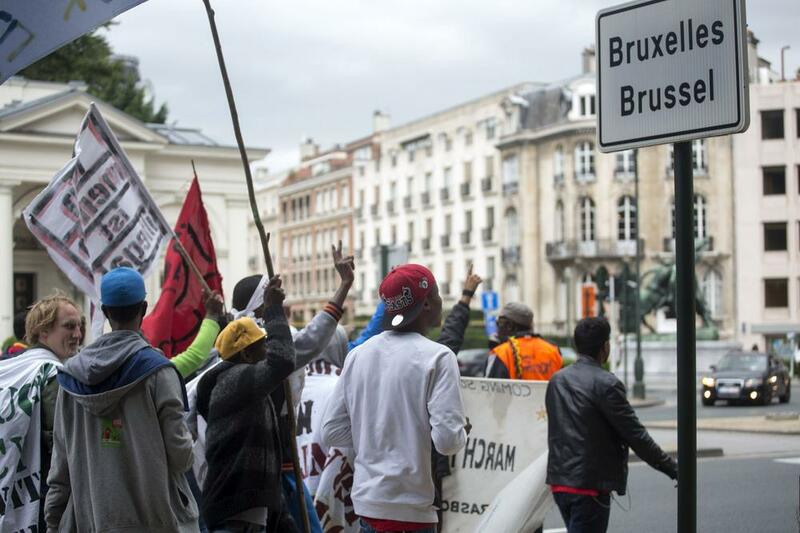 It became a central spot for the refugee strike, a movement fighting for equal rights for refugees in Europe during the last two years. The fact that a squat was evicted is, unfortunately, not surprising. However, in this case there are some additional aspects that are worth mentioning. Nonetheless, the city government was in a dialogue with the protesting refugees for more than a year without any progress. While not solving any of the problems the refugees are protesting against the promise was made, however, that there would be no eviction. People from all over Europe organise a Caravan For Freedom to protest against the repressive European migration regime. They are camping during the week 22 June-28 June in the Parc Maximilien in Brussel. 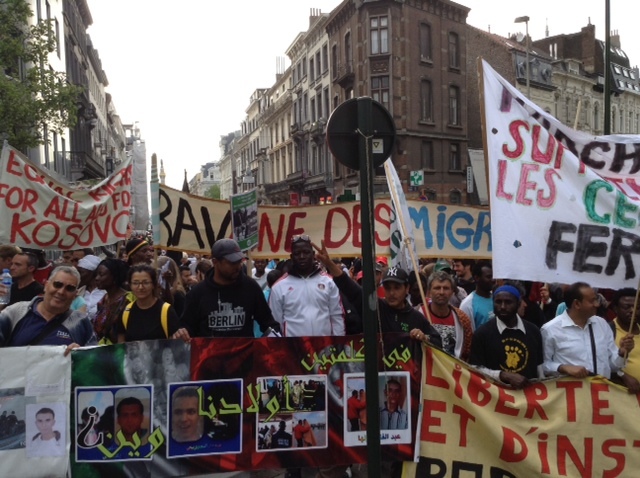 “March for Freedom” arrives in Bruxelles! A la frontière gréco-turque, l’agence européenne de surveillance des frontières extérieures, Frontex, participe à un dispositif qui empêche les réfugiés de bénéficier de la protection internationale. 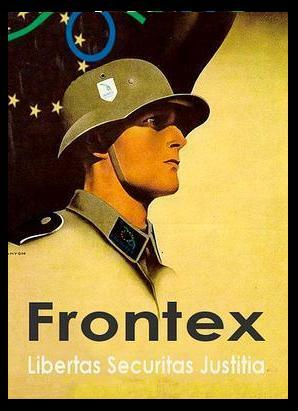 Le dernier rapport de la campagne FRONTEXIT, « Frontex entre Grèce et Turquie : la frontière du déni » souligne les conséquences dramatiques de l’intensification de la surveillance à cette frontière (« push back », non accès à la demande d’asile, violences physiques et verbales, etc.) ainsi que le défaut de responsabilité de l’agence. S’appuyant sur des dizaines de témoignages, ainsi que de nombreux échanges avec Frontex, le rapport documente des violations graves des droits humains commises dans ce centre de gravité des opérations de l’agence. Le Conseil de l’Europe, l’Agence des droits fondamentaux de l’Union européenne et le Rapporteur spécial des Nations Unies sur les droits humains des migrants ainsi que de nombreuses organisations de la société civile ont récemment exprimé leurs vives préoccupations vis-à-vis des violations commises à cette frontière. On June 9th, 2014 refugees detained in Corinth detention centre began a hunger strike to protest against indefinite detention. In February 2014, the Greek authorities had announced a policy of indefinite detention until repatriation, based on an opinion of the Legal Council of the Greek State. Only recently Athens court considered in an appeal-case of an Afghan refugee that the detention of more than 18 months is against national and European legislation and asked for it to be revoked. 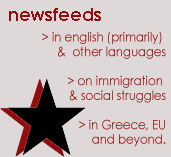 Many undocumented refugees were arrested by the Greek authorities since a year and a half (August 2012). The massive controls and arrests were realised in a very racist and cruel way. People were brought in detention centres all around Greece. Without going into a lot of details about the bad situation that we, all these refugees, went through, our only fault was that we didn’t have a piece of paper. When the detention centres were opened the Greek government published a law where the maximum detention period of a refugee was 6 months. Then they increased the detention period to a 1 year, then to 1 1/2 years and this is the maximum period that the Greek law allows today. But then suddenly some weeks ago they even increased the detention duration to open end periods!!!!! This step was a racist decision. It is injustice. The aim of this is only to stop us refugees from coming to Greece, us whom we left our countries due to our suffering. Now we are forced to suffer in Greece. With the systematic and open end detention the Greek government is massacring us. They are wasting our lives and killing our dreams and hopes inside the prisons. All of that while none of us has committed any crime. psychological. Specially those who stayed already more that 18 months are in a devastating state and desperately need support. 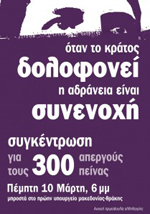 Today on 9.6.2014 we people detained in the detention centre of Corinth have started a hunger strike. We feel an immense pressure due to our unknown destinies. We protest against the illegal extension of the detention duration to more than 18 months! The AFM in a statement yesterday morning said it was involved in a large scale operation which involved 25 migrant boats at sea simultaneously. “The AFM is actively contributing to one of the largest aero-naval search and rescue operation that unfolded in the Mediterranean over the past years. Today we were brutally attacked by police forces in Luxembourg during our peaceful blockade action against the summit of the European Council. While the Ministers of Interior Affairs of every EU member state were sitting inside behind closed doors speaking about the Mediterranean Task Force, the new Executive Director of Frontex as well as better ways to administrate the Schengen Area. As the agenda of the summit concerns us, the victims of their laws and policies, we wanted to send representatives of the Protest March for Freedom to read out our demands, since our voices – as a group that‘s fighting for the rights of the oppressed – should be the priority topic of such a summit. Our peaceful blockade got violently smashed by the police and security forces in and around the conference building. During their whole operation the police was not communicating with us in any way, even though most of the officers speak three languages (english, french and german). They ignored all our attempts to talk with them in order to explain to them that we want to talk in behalf of the refugees during the summit. Pepper spray attacks, beating with battons, kicks and bites of the police dogs were the only answer we received. The police also told us that in case we move further into the building where the summit took place, they have the authority to use their guns against us. Many of us got injured.